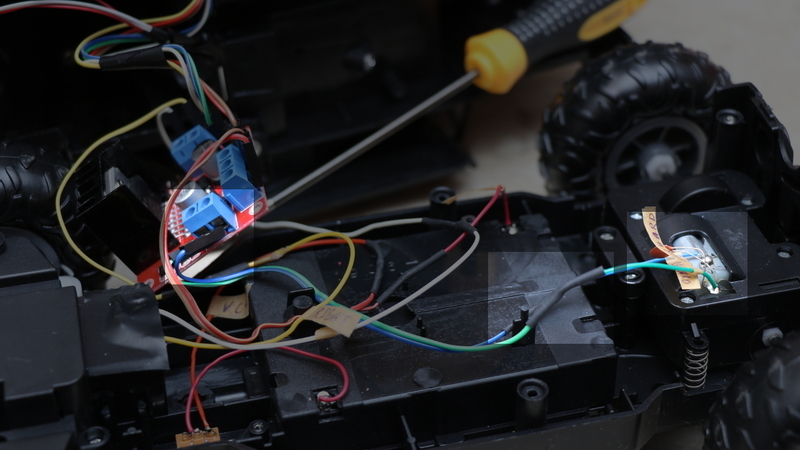 In this tutorial, we will connect the rear car motor to the driver. You remember the PCB Terminals? The cables from the motors should be connected to two of those PCB Terminals. Rear motor "Forward" goes to Output 1. Read Motor "Backward" goes to Output 2. The rear motor is at the back of the car. It has two cables. One of the cables is called forward because it would make the motor rotate and move the car forward. The other is backward. It will move the car backwards. The cables should already be marked in the previous steps of the course. Check the marks. In the picture you see three things highlighted. From left to right these are - the cables connected to the PCB Terminals, the cables extended with Heat Shrink Tubing and the cables at the end connected to the rear motor. The green cable is "forward" in our case and the blue is "backwards"